Last Monday, during a thunderstorm, an Amish home north of Mt. Hope, Ohio was struck by lightning. Today I took these pics of the new home that is going up in its place. I spoke briefly with a neighbor and one of the children that lived in the home. During the storm, when the lightning struck, there was only one person in the home, a twenty something old son. The parents were away on a trip to Pennsylvania when it happened. The young Amish man, noticing fire in the downstairs of the home, crawled out a window in the pouring rain, onto a porch roof, and started yelling for help. Folks in the adjacent house heard him and promptly brought a ladder to rescue him. The fire destroyed the home and most of the family’s belongings. Of course when tragedy like this strikes, the Amish community springs into action. The fire struck late Monday night. By the evening of the next day, the entire charred remains and debris, including the basement were cleared. The next four days were spent developing a new blueprint for the new house, excavating, pouring footer, laying cement blocks, putting together the material list, ordering materials, etc. On day number six after the fire, all the walls, floors, and roof were erected and framed. On day seven, today, the roof was almost finished by around 10am. Three work crews have been working on the construction. The entire process, until time to move into the new house, will be a couple to several weeks. 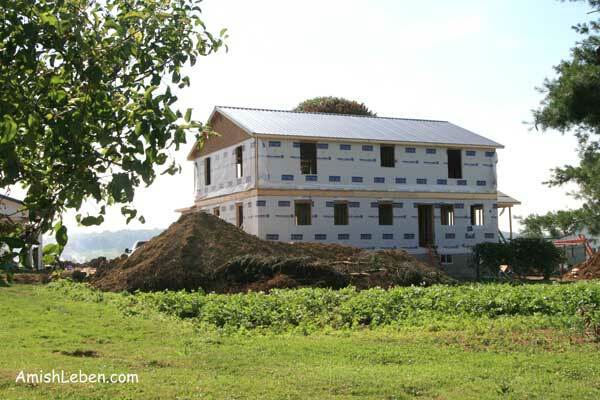 Most, or all, of the costs of rebuilding the new house will come from the Amish Church Fund. All I can say is the Amish know how to “GET ‘ER DONE”!